This is the original (and preferred!) family-based L.I.F.E. Program which gathers the children of each age level with their parents for a session directed by a trained facilitator. 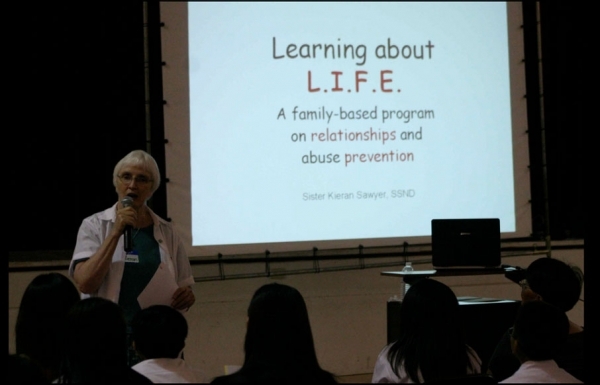 Trained facilitators guide parents in talking to their own children about positive and negative relationships, chastity, sexual abuse, and character development. Various faciliators offer age-appropriate interactive sessions for the six age-levels, preschool through high school. The facilitators find, download, and prepare all lesson plans, duplicating masters, and power points, which are available online in both English and Spanish. This format is provided for parishes or schools who have great difficulty getting the parents to attend. The sessions are begun in the classroom, taught by the regular teacher or catechist, and continued by parents at home following a packet provided by the teacher. The classroom teacher or catechist presents only the non-sensitive material concerning relationships. Some parents are recruited to act as small group leaders for the classroom sessions. All parents receive a take-home packet guiding them to review the material covered in class and instructing them how to teach the sensitive material regarding sexuality and sexual abuse. Parents return a response form indicating completion of the session. Principals and DRE's assure that response forms are returned and recorded. This format is provided for home-schooling parents, or parents who opt out of the parish/school chastity education and safe enviroment programs. The entire program is presented by parents in their own home. Parents receive a code from the parish/school giving them access to the online L.I.F.E. Program. Parents study the tutorial, download all materials, and present the program to their own children at home. A successful Learning about L.I.F.E. program requires the cooperation of all of the leaders within each parish: the pastor, the catechetical director, the school principal (if applicable), and representative parents. Each of these plays an important role in providing this valuable formative experience for the children of the parish and school. To be prepared to implement the program, each of these leaders is expected to study the introductory material (including the tutorial and the quiz) presented in the online program. Specific roles and responsibilities for the Family Format are outlined below; those for the Classroom and Home Formats will necessarily vary somewhat. The primary role of the pastor is to explain to his parishioners the importance of talking to their children about relationships, sexuality, chastity, and the sad reality of sexual abuse. The pastor introduces the L.I.F.E. Program to the parish and explains its role: to provide the special time and context for these important parent-child conversations to take place at each stage in the child’s relational development. It is recommended that the original letter introducing the program to the parish be signed by the pastor. In that letter and from the pulpit, he encourages the parents to bring their children to each of the various age-level sessions. If possible, he himself attends the sessions. His presence and support encourages the directors and facilitators, and helps to validate their message. Paramount to the success of the L.I.F.E. Program is the cooperative efforts of the pastor, the director of religious education, the school principal, the youth minister, and a group of parent representatives. This leadership team creates the atmosphere and builds the structures that are the foundations of the program. Become familiar with all aspects of the L.I.F.E. Program and decide to offer it in their parish/school. Engage the support of the pastor. Study the background and foundations of the program and successfully pass the corresponding quiz. Offer an explanatory overview session for all parents (optional but highly recommended). Put the L.I.F.E. sessions on the annual parish and school calendar and distribute this to all parents at the beginning of the year. Arrange for childcare during the sessions for any younger children who may accompany parents. Invite the regular catechists/teachers to attend the L.I.F.E. sessions and arrange that they be prepared to be dialogue partners with any child who may arrive without a parent. Prepare the space for the sessions: family groupings at tables, space for large-group gatherings of children and parents, chalk board or white board, projection equipment for Power Point slides, walking microphone for facilitator, registration table and name tags, refreshments. Assume responsibility for the mandatory reporting of any sexual abuse that might be surfaced through the program. It is highly recommended that a team of trained facilitators be created in your diocese or area. The members of this team can work together to present the L.I.F.E. sessions, to shadow one another durng the learning process, and to train new recruits. A team of two facilitators for each session is recommended. Each session is to be carefully prepared and presented by a trained program facilitator (or team). The importance of being well-prepared for the sessions cannot be over-emphasized. The facilitator must be able to present the content in a comfortable and engaging manner, to explain and guide the small group activities, and to be confident and at ease in responding to questions from parents and/or children. It is paramount that the facilitator has all materials ready to be distributed when needed, so as not to waste the time of the participating parents. Prepare to facilitate the particular grade level session(s) they will be teaching by printing the lesson plan, studying it thoroughly, making personal note cards, practicing difficult sections as needed, etc. Prepare all materials needed for the session, as described in the lesson plan: pens and pencils, Power Point presentation slides or teaching charts, handouts, project materials (crayons, scissors, etc.) for each table, special activity materials. Present the session with strong, humble confidence, secure in the belief that God's Holy Spirit will be working through them. After teaching the session, complete the Feedback and Evaluation Forms. Once they become comfortable with the material, the facilitators are encouraged to help recruit and train new L.I.F.E. facilitators. Parents have the primary responsibility for providing their children with ongoing information on relationships and sexuality, and for protecting them from abuse of all kinds. The L.I.F.E. Program is designed to help them fulfill this obligation. Parents follow the directives of the facilitator in explaining the material to their own child, in discussing material that is presented by the facilitator, and in the prayers and blessings. Parents continue the discussion at home as the opportunity arises. Disseminate promotional materials and collect registrations. Encourage the children to recruit their parents to attend with them. Welcome the parents and children as they arrive; assist in registration, name tags, etc. Participate in the session as observers to be prepared to answer questions in future classes. Partner with any children who may arrive at the session without their parents.